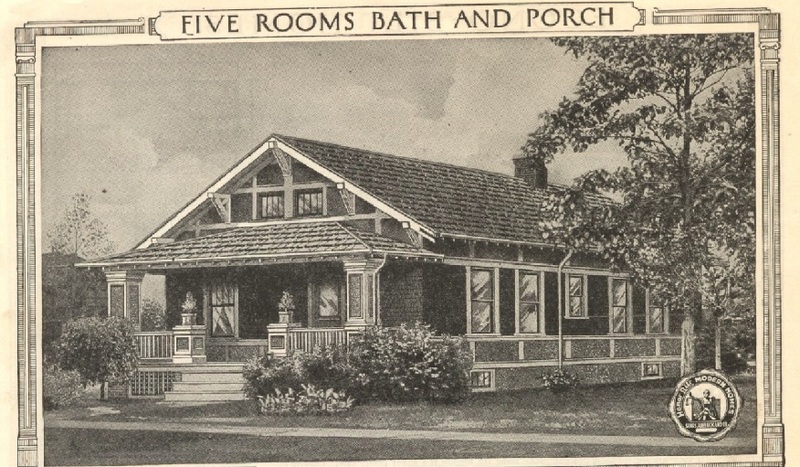 Sears Winona, from the 1922 Modern Homes catalog. A daughter of the original homeowners stated that her parents purchased this brick bungalow from Sears. Additionally, you can tell the house is a Sears house from the unique eaves brackets. Many Sears houses have these stick-design brackets. But the house on Greenview is a big house (about 40 feet deep) and did not exactly match any of the illustrations in the catalogs. This got me looking at the alternate floor plans available for some of the popular models. I believe the house on Greenview is the large version of the Sears Winona. The house was built in the mid-1920's and, from the outside, the floor plans seem to match. Larger floor plan for the Winona. Look at the window placement. Left side is an exact match. Right side is an exact match too. The house on Greenview is brick, and the Winona was typically sold with a stucco exterior finish. Customers occasionally opted for a different exterior finish. The porch was enclosed and the upper floor was expanded by the use of dormers on the sides. Also the pair of tiny front windows was replaced by larger windows. The first occupants of the house were John Friedrich "Fred" Klipstein, his wife Ella, and their four children. Fred was a cement contractor and built the house himself (which was originally numbered 1056 Greenview). They moved from Wisconsin into the house in Des Plaines sometime after 1920. At the time this house was built, the area was mostly prairie. In 1940, the Klipsteins were living in the house with their son Raleigh and his family.